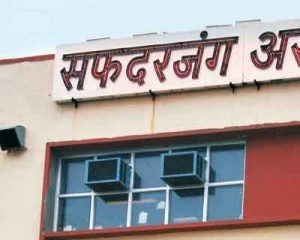 New Delhi: The Safdarjung hospital has claimed that there was no medical negligence in the case in which a newborn baby was nearly buried alive after being declared dead by doctors at the hospital. In a press statement, the hospital has claimed the baby’s mother, Shanti Devi, was 20 weeks pregnant and spontaneously aborted a foetus of 410 grams. The foetus was under observation in labour room for two hours and it did not show signs of life clinically and was handed over to the father, A K Rai, the medical superintendent of the hospital, said. Rai said the “foetus had limb movement after three hours which is possible because abortuses (aborted foetuses) below 22 weeks of gestation often have prolonged periods of cessation of respiration and feeble heart which may lead to difficulty in appreciating clinical signs of life”. “As per Medical Termination of Pregnancy law in India, the 20-week foetus is legally not viable so there is no case of medical negligence. There is no lapse on the part of the hospital,” he said in the statement. The 28-year-old Shanti Devi, a resident of Badarpur, had had given birth at around 5 am on Sunday. Doctors had declared the baby dead, sealed the body in a pack and handed it over to the father for burial. It was only after relatives decided to take one last look at the baby and the bag was opened that they noticed the newborns limbs twitching. He was then immediately shifted to the Neonatal ICU where it managed to survive for about 30 hours. The baby died at 4.15 pm on Monday. The hospital had ordered an inquiry into the matter.